Some Mac and iPhone owners who had been using Safari to view RSS feeds — Really Simple Syndication feeds of Web content — may have been dismayed when native RSS got the boot with OS X Mountain Lion for desktops and iOS 6 for iPhone. Now it seems that RSS feeds on mobile Safari in iOS 5 are unavailable, as well. A series of tests conducted by AllThingsD earlier today on different iPhones showed that RSS feeds usually accessible through .Mac Reader (reader.mac.com) on mobile Safari were unavailable on devices running iOS 5. Attempts to view RSS feeds for news Web sites through reader.mac.com resulted in consistent “Service Unavailable” notifications. And according to checks on Down For Everyone or Just Me and Websitedown, reader.mac.com appears to be down. It’s not the first time reader.mac.com has suffered service interruptions. This time, it has been down for more than a few hours. When asked about its mobile RSS reader, Apple declined to comment or offer insight into whether this is a temporary service glitch or if Safari RSS is gone for good from iOS 5. With the launch of its new desktop operating system, OS X Mountain Lion, late last month, Apple released an update to its Safari Web browser that doesn’t support RSS feeds within the browser. 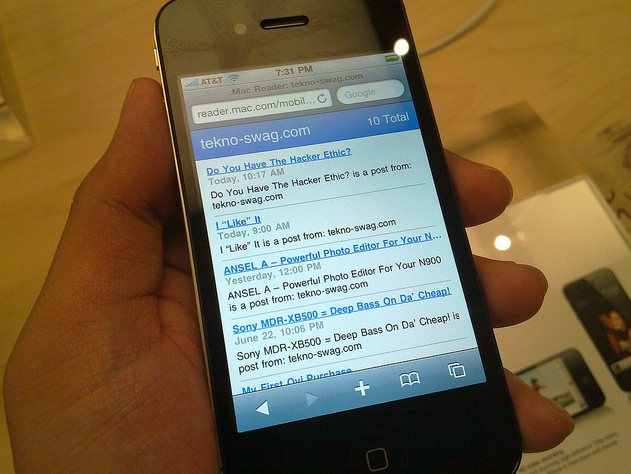 It has since been reported that in iOS 6, which is currently available in beta for developers, mobile Safari “no longer registers” for the common RSS or Atom feed. The user is now prompted to view Safari RSS feeds in a separate, dedicated app. A couple workarounds have been created — like this Subscribe to Feed button and this Automator workflow — but the bigger question, aside from how to get your feeds in Safari, is whether RSS as a content delivery tool is slowly being put out to pasture. If that’s the case, Apple isn’t alone in its RSS phase-out. Google Chrome used to display RSS as a raw source file, but it now prompts the user for an external app to view RSS feeds. Of course, with the new iOS being a work in progress, and with Apple currently planning an event at which the company is widely expected to debut a new iPhone model, it’s not out of the realm of possibility that Apple could introduce a new notification system that pushes feeds through in a different way. Or maybe the polite suggestion that users, for now, find a dedicated reader for their RSS feeds is really just that — and a new RSS solution isn’t necessarily on the horizon. We’ll update as we have more information on .Mac Reader on iOS. Update: It appears now that .Mac Reader is back up and and running. Apple hasn’t offered an explanation for what caused the service interruption for several hours today.